A skid-steer loader is one of the most versatile pieces of construction equipment. Using different attachments, a skid-steer loader can perform a range of tasks, from excavation and gradiing to demolition and debris removal to overhead work and lifting. Best of all, its compact size makes it useful indoors and in many applications where larger equipment won't fit. How large is the space available to operate the equipment? Is the loader going to be used over open, unfinished areas or developed and paved areas? What type of loads will the loader lift or move? How far will loads be hauled for moving or dumping? What type of work will the skid-steer loader will be performing: drilling, hauling, demolishing, earthwork, sweeping, etc.? A small skid-steer loader is most able to maneuver in tight spaces and drive through narrow passageways, making it the best choice for interior work. Small loaders are the most common size used for landscaping, site development, and final grading and to add soil layers over patios, sidewalks and other areas. They are also preferred for work on underground parking structures, due to their low profile and relatively lightweight. Finally, small loaders are great small demolition projects and can be equipped with almost any hydraulic attachment. 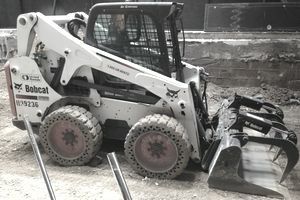 A medium-size skid-steer loader can be used in many other areas where a small loader is not suitable to complete the work. For example, this machine can be used when there is no room for large backhoes or excavators and where a digger is not allowed. It can be equipped with either tires or tracks and can drive over sidewalks, concrete plaza, asphalt and landscaped areas without subgrade rutting. Large loaders are suitable for extensive grading work, excavation, drilling, and larger demolition work. Due to its quickness and relatively low profile, a large loader can be moved around the site without the need for transport by a semi-truck. When equipped with hydraulic attachments, a large loader can be used to haul and dump a lot of soil. It can also be used as a telehandler and for forestry operations. Are there special financial considerations and licensing requirements? What are the estimated maintenance and operation costs, including hiring an operator? What attachments might you need to buy? Will you be using this equipment regularly for future projects? If not, can you rent it out?